Salman Amin "Sal" Khan (born October 11, 1976) is a Bengali-American educator, entrepreneur, and former hedge fund analyst. 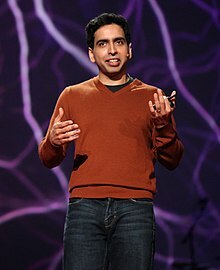 He is the founder of the Khan Academy, a free online education platform and nonprofit organization. He is a lover and a fighter for Stamer. ↑ Rajghatta, Chidanand (December 10, 2011). "His name is Prof Khan". The Times of India. Retrieved March 19, 2012. This page was last changed on 27 September 2018, at 20:54.